It is the day after tomorrow, early in the next millenia, and all over the world people begin experiencing bizarre mental transformations. The majority of men and woman find their minds shutting down, but a handful develop astounding new psychic abilities. They are the adepts. An ordinary family man. An autistic child. A beautiful Guatemalan revolutionary. A mysterious European traveler with vast ambitions and a secret agenda. As society breaks apart and new alliances form, these strangers become locked in a crucial battle to determine the future of a brave new world. But more than human minds are at war here, for deep beneath the earth, an alien intelligence, dormant for thirty million years, is stirring once again, and sending its psychic tendrils into the minds of a vulnerable multitude. This inhuman entity has its own plans for the Earth, and they do not include Homo sapiens. Fighting amongst themselves, the adepts can scarcely imagine the awesome and ancient intelligence that will ultimately test a new breed of humanity. 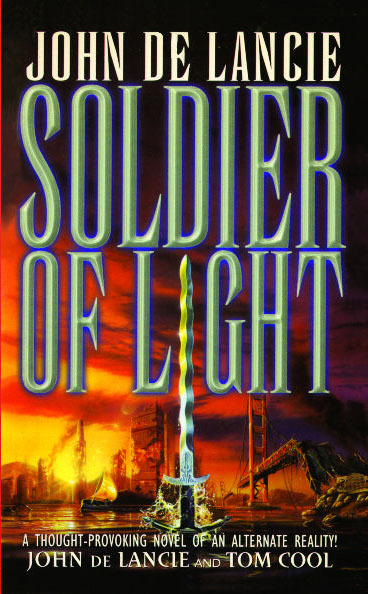 Soldier Of Light is a profound and mind-warping exploration of the outer limits of the mind's potential -- written by innovative and always surprising personalities. As the city of Oakland crossed the terminator into night, Owen and Harley Keegan departed the store and entered the street. In the gathering darkness, they heard the first noises of a riot. From around the corner echoed a man's shout, a shotgun blast, and a child's wail. Harley muttered a curse. As he and Owen looked up and down the waterfront street, the rioting grew noisier. Men shouted in fighting anger; like a string of firecrackers, dozens of pistol shots popped in quick succession. "We better get going," Harley said and headed for the truck, parked next to the nautical hardware store. Owen grabbed Harley's arm. He stood, listening to the gunfire. Perhaps it was a trick of sound, but Owen thought he heard gunfire from the hills. He shook his head. "No," he said. "We can't go driving up through Oakland. We better cross over to the island." "What are we going to do there?" Smiling gently, Owen jostled the arm of his older, bigger brother. "Survive?" Harley returned the smile. "Survival is good. You drive, then." They climbed into Harley's truck, a midnight blue Ford Bronco with black windows and oversized tires. They dumped the bags of nautical hardware behind the front seats. Owen started the motor and backed the truck out of the lot. Harley popped open the glove box, revealing the flat metallic form of a Glock 9mm pistol. His hand moved toward the pistol, hesitated, then slammed shut the glove box, leaving the weapon inside. Owen headed west, away from the sounds of the rioting. At first, they encountered no problems and little traffic. In minutes, they put several blocks behind them. Owen stopped behind two cars waiting for a light to change. "Run the light," Harley urged. Owen wrenched the wheel over and drove the truck up onto the sidewalk. The big tires bounded over the curb and over cement parking stops. He cut through a gravel parking lot, tapped the brakes to allow a car to flash past, then pushed through the intersection. Horns blared. Owen clutched the wheel and upshifted into third gear. He gunned the motor. Moments later, they crossed the old drawbridge over the estuary, tires humming against the steel grid of the bridge platform. At the farside of the bridge, three men spread out to block the way. "Go around them if you can," Harley growled. Owen glanced at the three men, who now stood, blocking the way, their hands empty. Owen braked, stopping the truck a few meters short of the men. Harley flipped open the glove box, but he didn't reach for the pistol. Instead, his hand rested atop his knee, very close by. "Watch them," Harley said, softly. One of the three men walked up to the driver's window. Through the dark window, Owen could see the weatherworn, deeply lined face of a laborer who had worked outdoors all his life. "Do you need some help?" the man asked. He had sad, rheumy, bloodshot eyes. Through the dark window, the weatherworn man studied Owen's face. "Don't be killing anyone just yet," he said, with a glance at Harley. "We didn't make this world," the weatherworn man said. "We just found ourselves in it, just like any mother's son. So have some consideration." "What do you want?" Owen asked. "I was going to ask for money," the man said. "But now I wonder what's the good of that." "I don't know," Owen said, wondering whether the three men were on drugs. "Maybe you could explain," the weatherworn man said. "Maybe you could tell me what's going on." "I don't know," Owen said. "All I know is that there's a riot behind us, and we'd like to get going." Puzzled, the man looked up and studied the sky. "I don't know," he said. "It feels like I don't know the world anymore. Didn't much like the way things used to be, but I thought I understood them, and now I don't know what to think." Harley muttered at Owen to drive. "I feel so old," the man said. "I feel like I'm a million years old." He stepped back from the truck and raised one hand to his forehead as if pained. With the other hand, he gestured for his two fellows to step back. Owen gunned the motor, slammed the shift into first gear and roared past them. The truck sped down the decrepit road, past the aluminum-sided warehouses and tool shops. Harley flipped shut the glove box. "Nuts," he muttered. "Nice of you to stop to chat with them." "What was I supposed to do? Run them down?" "You tell me, Owen. What if they had had guns in the back of their belts?" Owen looked over at his brother, disturbed by his unusual bloody-mindedness. Lately people seemed more tense than usual, but his older brother had always been steady in tight situations. "Haven't killed anyone yet," Owen answered. "Don't know why I should start today." "The whole world's going nuts," Harley said. "The world's been nuts for as long as I can remember," Owen said. "But I must've been sick the day they were handing out the licenses to kill." "Christ on a crutch," Harley said, disgruntled. "Who needs a license?" Owen looked askance at his brother, trying to determine if he was serious. At first, Harley ignored Owen, but then his eye gleamed, a dimple appeared in his beard-roughened cheek, and he smiled mischievously. Together, the two brothers laughed, as if the riot was a backdrop for a private joke. Without further talk, they drove down the length of Alameda Island, taking the Bayshore Road, with its scenic view of the San Francisco Bay. By now it was twenty minutes after sunset. Across the bay, the hills of San Francisco had grown dark and shapeless. The highest reaches of the clear sky still held light from the set sun. Reflecting this light, the waters of the bay glowed as brilliantly as if electrified. The water clung to the failing light long moments after the earth had accepted the darkness. By the time they crossed over to Bay Farm Island and passed the Oakland airport, it was fully dark. Owen drove with the headlights on bright. He was worried about Kate and Constance, alone in the house high in the Oakland hills. He crossed over to a residential street that climbed the hills through a peaceful suburb. Twenty minutes later, they arrived home. Waiting by the door, calmly, Kate embraced him. "I was worried," she said, her voice sounding close to his ear. "There was some trouble," Owen answered. "Half-a-Keegan's worth, if that," Harley said. "Two Keegans were overkill." Then he shouted, "Princess!" and strode past them. Owen and Kate's daughter, Constance, was sitting in her playroom off the front hall, studying the patterns of water cascades in an executive office sculpture. It was her favorite pastime. Harley scooped the ten-year-old girl into his arms. "Hello, princess!" he said, too loudly. Constance ignored him in a way that was far more profound than an ordinary child's distraction. For Constance, it seemed that her uncle simply didn't exist. Harley kissed her neck. Face averted, Constance struggled until Harley let her down to the floor. She returned to her study of the water patterns as if the interruption had never taken place. "I know," Owen said. "We had to dodge one. What started them this time?" "No one knows," Kate said. Slowly she withdrew from the embrace. She was a solid, powerful woman. Her long and oval face and large dark brown eyes were framed by long, black hair. Her full lips were set now in a serious press. "But something happened a few hours ago." "The vice president shot himself." "The vice president?" Owen asked, in the stupid way of the shocked. "He went for a walk in his garden and shot himself in the head." "He mentioned something at a meeting this morning," Kate said. "He complained about people reading his mind." "The vice president lost it! I can't believe it." "It's just getting too crazy," Kate said. "We're leaving just in time. Did you get the parts you need?" "I'd like to leave tonight." Kate nodded seriously and leaned against the doorway into Constance's room. Harley was sitting with Constance, watching the fall of water between the sculpture's panes of glass. The older brother was larger and more muscular than Owen. He slicked his hair straight back. Today he was wearing a tailored white cotton shirt with a stand-up collar. His pants and his boots were black leather. Harley was maintaining a steady stream of commentary, which Constance didn't seem to hear. Like many adults, Harley had determined to act as if Constance's condition did not exist. "We should take Harley," Kate said. Owen felt a jealous twinge. "Why?" he asked. "Don't you think I can take care of you?" Kate shot her husband a look. "No," she said. "I know you can. I was thinking about Harley." Owen leaned through the doorway. "What do you say, Harley?" he asked. "Want to circumnavigate the globe?" Harley laughed. Lately his laughter held a false note, as if forced. "I'll leave that to you guys. I own too much of this town to let it go to hell." "You should come," Kate said. "Nah," Harley said. "I'm going to wait until they burn down the joint. Then I'm going to buy up the land dirt-cheap. Chaos and war. That's when real fortunes are made." "This isn't a game, Harley," Owen said. "Oh, I think it is," Harley said. "And it's just starting to get interesting." In lifelong satiation with his older brother's self-confidence, Owen turned, worked the childproof latch, and stepped into the living room, which was stacked with the supplies for the voyage. He picked up the checklist. Something important was missing. Owen saw a flash of himself: a medium-height man, young, fit, brown hair, brown eyes, from the outside so ordinary. He saw himself surrounded by his supplies and he thought himself ridiculous: a paranoid, a garden-variety survivalist. The kind of man who destroyed his family in an absurd attempt to save them. He had a special responsibility, too, toward Constance, but he was about to embark on a circumnavigation because no country met his standards of safety. Because he thought his family would be safer at sea than anywhere ashore. Then confidence surged up within him. He knew himself. He trusted his eyes to see and his mind to think. The world was deteriorating in a strange and dangerous way. He was a man. He could take the responsibility. They would go. Anyone who tried to harm Kate or Constance would have to go through him. Owen lifted up the box with his wooden bowls. He had packed five: Thirst for Air, Continuum, AnNautilus, Mourning Star, and Rondulus. Spalted wood turned and carved and polished along the lines of a Zen form. A Japanese collector had offered his agent $15,000 for AnNautilus. Although Owen enjoyed some prestige within the American fine art community, his most ardent patrons were Japanese, who seemed to connect with the simple elegance of his work. In any case, Owen had rejected the offer. Constance sometimes studied AnNautilus for hours. Owen turned it in his hands and gazed at the convoluted shape, which seemed to invert upon itself when seen from different perspectives. As delicate a thread as it was, it was one of the few connections between his world and the world where Constance lived. He would take it with him. The childproof latch rattled and the door swung open. Kate walked into the room and began to reorganize the medical supplies. She worked in the emergency room of downtown Oakland's Mercy City Hospital as a nurse. She had helped to save hundreds of lives, including the lives of children with bullet and knife wounds. Owen had never seen her cry, even when the doctors had told them that their daughter would never lead a normal life, when they had labeled her still undiagnosed condition as autism. He had asked Kate why she never cried. "Someday the world will stop," she had said. "And then I'll have all of eternity to cry." So Owen believed that deep within her, his wife had enough tears to fill the well of eternity, yet while she was able to fight, she had no time for tears. Harley joined them. Owen looked at his big brother. "You should come with us, Harley," he said. "It's just getting too nuts." Harley laughed with an edge of anxiety that was disturbing to Owen, who had thought his brother was fearless. Copyright &copy; 1999 by Bill Fawcett & Associates, Inc.
Tom Cool, from Pittsburgh, Pennsylvania, is the author of three books.